You wouldn’t think FRP products would have uses in hospitality buildings, such as hotels and motels, that would be described as “attractive” or “excellent architecture” but nothing could be further from the truth! FRP products are quite attractive and can add beauty in addition to strength and lower lifecycle costs. FRP, while more expensive than traditional materials such as concrete, wood and metal, FRP is easier to install, virtually maintenance free, and will more than earn back its value in labour saved. Common applications include handrails, stairs and stair treads, and fencing. The FRP components are often shipped out with a polyurethane base coated paint. This provides UV-resistance to the product and permits painting over it. 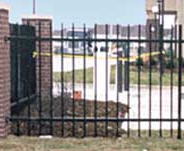 People have become quite creative with FRP in these applications especially with fencing allowing the product to mimic the color and appearance of wrought iron as an example. With careful selection of the product and the application of paint you’re really only limited by your imagination. Using FRP in the hospitality industry is especially beneficial when your buildings are exposed to harsh elements: particularly salt, water, heat, wind, or even insects. Insects will not attack FRP structures unlike wood! These products are also beneficial when, frankly, you do not have a large maintenance staff or would prefer them to do more important tasks than maintaining stairs and handrails. For more information if an FRP solution is right for your hotel or motel, please contact us today to discuss. Requests for information on fiberglass reinforced plastic (FRP) products come for many reasons. The best opportunities for an application with FRP exist when two or more of its differentiating properties are very beneficial or required for a given application. FRP is least suitable for an application where the primary concern is cost and otherwise there are no advantages to choosing FRP. One advantage can leave the application up to the purchaser – FRP will provide an advantage over traditional materials but is it worth the increased cost? Cost defined here is upfront costs at the time of purchasing. In virtually any application FRP will have a lower life cycle cost and is to be valued for that reason. 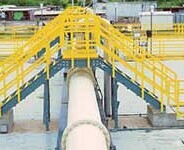 FRP offers numerous advantages in applications starting with the fact that it will not rot or rust. This makes is much longer lasting than traditional materials. FRP also has intrinsic chemical resistance and is lighter in weight than any other option making installation quick and easy. Specific advantages versus wood are due to longevity. Wood is biological, and it will eventually degrade, split, rot, etc. FRP will do none of these things, and is significantly stronger than wood all around. Metals are heavier, may rust, and conduct electricity. FRP is non-conductive and is also available in fire retardant forms (to match an advantage metal is considered to have). In addition, FRP is a very poor conductor of heat. So in a fire, metal grating may conduct heat readily while FRP grating would not. In summary, FRP offers substantial advantages and cost-saving benefits over traditional competitive materials. For assistance with your FRP project, contact us today. One excellent FRP product for a particular application, underwater flow control, are FRP baffle panels. These panels are made out of polyester resin with other resin systems available, including vinyl ester for the most corrosive applications, and NSF 61 compliant resin for potable water. The panels are very corrosion resistant and include a UV-inhibitor for long term outdoor use. They are lightweight, easy to install, and will not rot or rust. They can be mounted to panels, attached to H-beams, or attached to concrete walls with clip angles. For a quotation on these baffle panels please contact us today. FRP applications are valued for the advantages fiberglass composites bring to the table that traditional materials such as metal or wood simply cannot. First among these are corrosion-resistance and that it will not rot. In addition, for potable water applications most products can be NSF 61 certified. What this means is a long-lasting, low-maintenance material for countless applications in submerged wet environments. The first application of note is as ladders and handrails. FRP usually replaces metal here, and retains the required strength for the application while not succumbing to corrosion. Another notable application is as odor control covers. In wastewater applications FRP provides a light product that is strong with low thermal conductivity as well. Baffle panels are also made of FRP and are available in 12″ and 24″ widths made out of UV stable polyester resin. As with most FRP products, these baffle panels can be certified as NSF 61 safe. Lastly, don’t forget about our ability to supply a custom solution to virtually any need at your plant, for example designing and supplying a walkway over a pipe as shown in the picture. For more information on the benefits FRP brings to your water/wastewater applications please contact us. If one or more of those traits are priorities in your application than FRP angle may be an excellent substitute for standard iron angle. 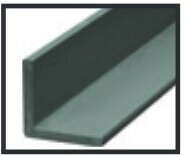 FRP angle* is stocked by the manufacturer in many sizes from 1″ x 1/8″ (thick) to 6″ x 1/2″. These angles are all manufactured using the three standard EXTREN resin systems: EXTREN 500 for general use, EXTREN 525 for fire-retardancy, and EXTREN 626 for especially demanding applications where extra corrosion-resistance is needed. While the FRP angle is more expensive than traditional angle iron, it simply offers properties that metal angle cannot. To get a quotation on FRP angle for your project, please contact us. *Please note what we are referencing here is “equal leg angle”. Custom profiles can be quoted for unequal angle; however, minimum orders and tooling fees may apply. The HD series of fiberglass reinforced plastic (FRP) grating is design to solve one issue: vehicle traffic. Other forms of FRP grating, both molded and pultruded, are for foot traffic only. Customers frequently have the response of “well how much vehicle traffic can the other stuff take before it breaks?” The answer is it is untested. However, when it comes to FRP we are often not simply told what to quote, but to make a recommendation. And we do not recommend vehicle traffic on any FRP grating except for HD series grating. 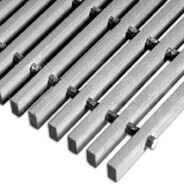 The HD series, or “heavy duty”, is made up of thick, rectangular bearing bars and cross-rods. It is similar to the other pultruded FRP grating systems expect that it is only available in the large, thick rectangles 1″, “1.25”, 1.5″, 1.75″, 2″, 2.25″ and 2.5″ thick. 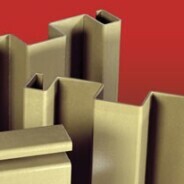 This means that the product is not manufactured in an “I” or “T” shape unlike other pultruded FRP products. The grating brochure available off the Redwood Plastics website gives a full load table and specs for the HD-6000 grating. You can access the grating brochure here. For assistance with your FRP projects, please contact us. It is important to understand the materials you’re using in your application and by knowing the makeup of Redco FRP you come to appreciate the advantages it brings to the table. FRP stands for “fiberglass reinforced plastic” and for the most part FRP involves the following components: glass fibers, glass mat, synthetic surface veil, and resin. The glass fibers are probably what you think of when you think of the “glass” in fiberglass. These are bunches of long strands of glass fibers and they give impressive longitudinal strength to the end product. Wrapped over the glass fibers is glass mat, which gives strength in all directions (omnidirectional strength). Those two components are then further bound by a synthetic surfacing veil. This veil is not in all fiberglass products available worldwide but is an important component to Redco FRP. 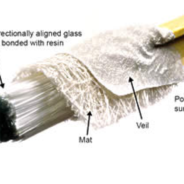 The surfacing veil both binds the glass mat and fibers (also known as “rovings” together) providing composite strength but also importantly serves as a UV inhibitor and prevents the components underneath from “blooming” through the resin. The final component is the resin itself which most people would know as the “plastic”. The FRP is subjected to a bath of resin which coats all the components and then is pulled through a die or set in a mold. 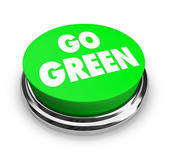 The “general purpose” resin used is polyester; however, two other resins are used in certain applications. Vinyl ester resin is more expensive and offers the same benefits as polyester except with much better corrosion resistance and tends to last even longer in applications. 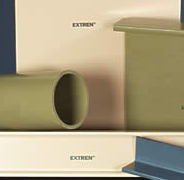 This resin is most commonly used in EXTREN 625 products. The other special resin is “phenolic” and this provides fire and heat resistance not normally found with other FRP resins. Phenolic resin is especially valued by the Oil & Gas industry and can withstand fire while retaining its structural property for enough time to permit an evacuation. 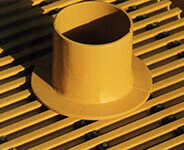 A good example application for phenolic resin is as FRP grating for oil drilling platforms. If you have questions on FRP components and the advantages they provide to your application then please contact us today. Recently one of our representatives in Canada was approached with an FRP application. The customer wanted an anti-slip surface on their stairs; however, replacing the stairs with a full FRP stair solution was not possible. Instead, our rep had the idea of taking 1.5″ x 1.5″ x 1/8″ FRP angle and turning it into a solution. The angle was painted in safety yellow color and covered in a coarse grit surface and then cut-to-size. The treads were tapped and bolted on site to the existing grating with hardware procured elsewhere. 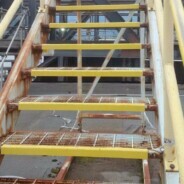 This solution was much less expensive than replacing the stairs or getting them coated with another anti-slip product. Unlike the traditional materials of metal and wood, FRP will not rot, rust, or corrode. It will provide the customer with the benefit of a near maintenance-free anti-slip solution for many years. If you think this solution might help your business please contact us today.